Based on the legendary Bighorn, the new Bighorn 2.0 is a lightweight version that mimics the tread design of the original Bighorn, with a slimmer profile. Radial construction provides better shock absorption, allowing for a smoother ride. The non-directional pattern provides predictable cornering and claws up roots and rocks, creating optimum climbing confidence. The Bighorn 2.0 boasts a 6-ply rating, offering the durability that youâ€™ve grown to expect from Bighorn tires. 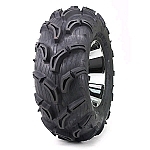 - Maxxis Bighorn 2.0 ATV Tires are sold individually. Bought these to replace the stock tires that came on my Grizzly 700. I went with the 26" tires (stock was 25") and was a little concerned about power loss because I ride very aggressively. There was a little loss, but the additional traction and better handling more than makes up for it. The ride is much smoother, especially over rocky trails. Tractions is awesome. I was climbing hills in 2wd that previously needed 4wd. I know these aren't touted as a mud tire, but WOW, they can tear it up in the mud. In the title I said the tires are almost too good because my son and I always try to shoot mud on each other. With these tires when I power brake to throw mud it sometime just takes off - that never happened with the stock tires. 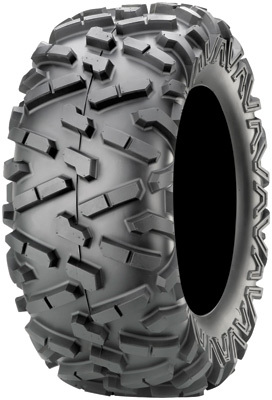 I purchased these tires to replace the stock tires on my Brand New 2011 Kawasaki Brute Frce 750i. What a difference they make. I took the stock tires off at 4 miles from new. These tires make a huge difference. Very pleased with tires and how quick they were delivered. Will use Offroad in the future! Great service tires got here sooner than I thought. I put 26x9x12 on my pioneer 500 and so far they really seem tough and grip good. 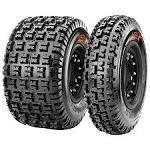 I like they way these tires ride.They ride so much smoother than the stock tires, and I have used them in mud and hard pack road riding and this is a good all around use tire for any condition. Wow, what a difference in traction and ride with these Radial tires!! These tires are great. Ride quality way better than factory oem tires. Could not believe it. Placed these with a set of MSA 20 rims. Was not disappointed. This is an all around good tire for my location. Awesome tires, gave my Rhino a totally different look! These tires are worth every penny! Mounted these 28x9x14 tires on Walker Evans 14x6 beadlock wheels. Got quite a bit of snow so the riding has been limited. They are a little lighter and ride a little softer than my old 8 ply tires which is a plus. The thread is non-directional and since I have the same size on all 4 corners I will be able to rotate the tires to improve thread life. Order these tires during the height of the Xmas shipping season so they took at little longer than normal to arrive but that was to be expected. Very pleased with the purchase so far. Received tires promptly. The tire has a great tread pattern. They handle well in the dirt and snow. Got the 2.0s on ITP 14" rims. THey shipped same day, had them in 3 days. They fit right on my bike (2013 Outlander Max LTD). They really were abit shorter than i expected. I think this is a good thing as the fronts rubbed just a wee bit on really rough terrain. These tires are a 1000% improvement over the stock rubber. They give me confidence and go anywhere. I do think i had a little too much pressure in them (9-10psi) and it seemed to make the bike a little bouncy. I have since left air out and will need to try it. There was a big water hole that folks were going through. Most folks were spinning and we jsut chugged through on the bike. Q: If I get a 14x7 rim, which tire should I get 28x9-14 or 28x11-14? A: You could go with either size on the 14x7. Both would work fine. I personally would do the 28x9. Q: What ply tires are these?